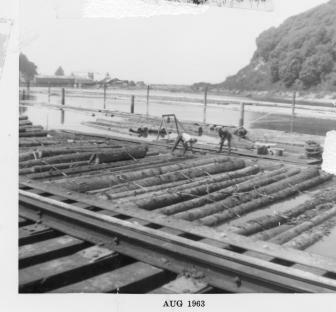 Balch Wharf pilings. 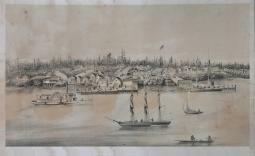 Wharf had been built in 1851/2. Lafayette Street, Davidson's Store at right. Looking up Main Street from Fafayette. Large tree is in front of Orr Wagon Shop. Essentially same view as Scenes150. 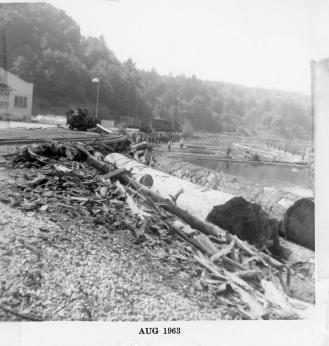 Silver Beach gravel works just north of Sunnyside Beach, operated by Thompson's Steilacoom Sand and Gravel Co.
Logging operation (skidding logs with oxen team) near Steilacoom. 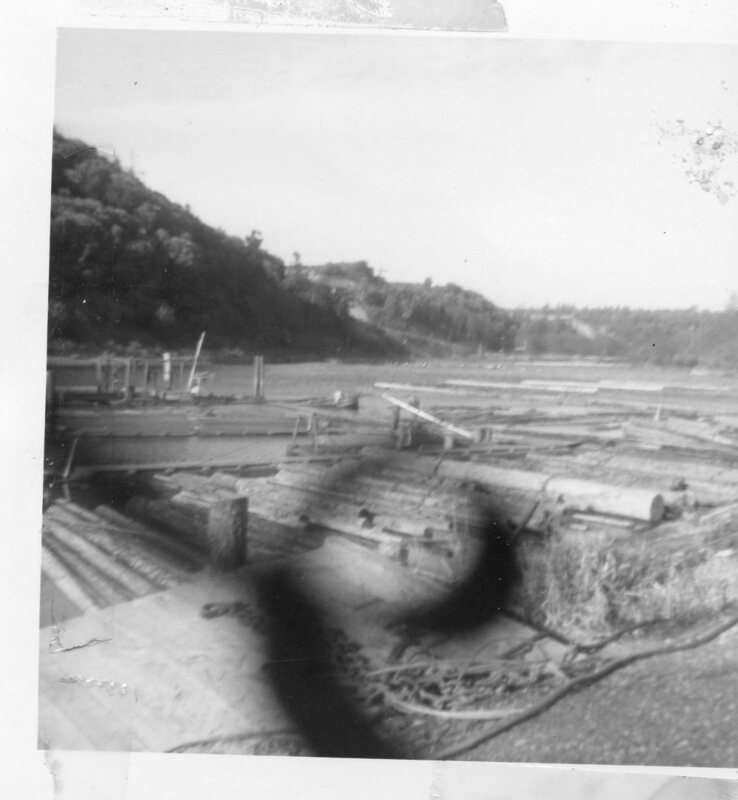 Photo from collection of Hattie Bair. Railroad tracks going by mouth of 5th Street Waterway. McNeil Island in background. 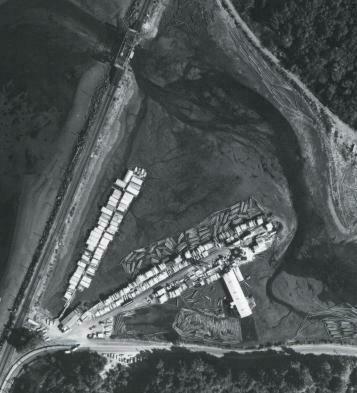 Early photo of Chambers Bay at low tide showing trolley track trestle going across mouth of creek (Garrison Creek?) that was later channeled underground and the area filled in. 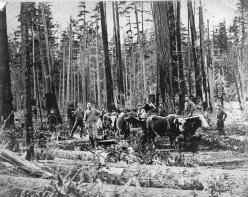 Later, a paper mill was built on the filled-in land. 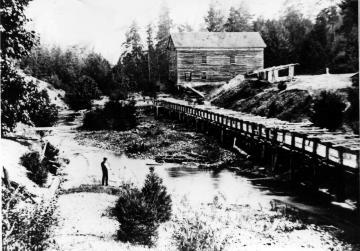 Thomas Chambers' sawmill may have been at the head of the creek canyon, and may have used the water power of the creek to operate his saws. 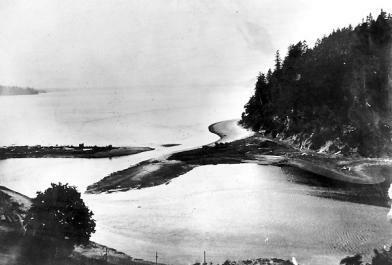 Close up of spit partially blocking mouth of Chambers Creek, just as it does today. 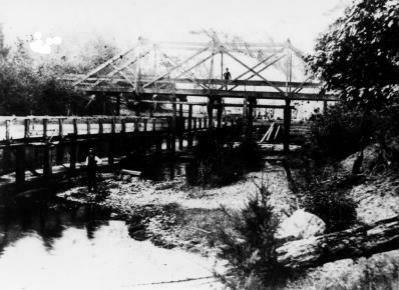 This photo is probably clipped from the same photo used to produce the postcard in Scenes172. 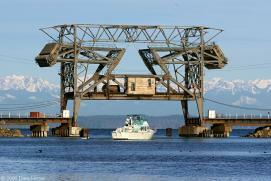 Boat entering Chambers Bay under railway bridge. Olympic Mountains in background. 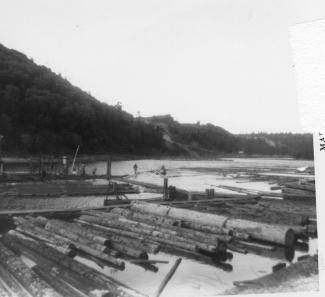 Workers tending floating logs headed for West Tacoma Newsprint mill which was behind the photographer. 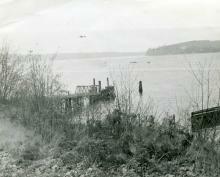 View is toward mouth of Chambers Creek (note railroad bridge in the distance). Scenes176 through Scenes189 were donated to SHMA in 2010 by Gloria and Paul Miller, decendents of Paul Miller who worked at the mill in 1963. Boise Cascade bought the mill and later sold it to Abitibi Consolidated who closed the mill in 2000. Demolition of the mill in preparation for lease or sale of the land began in 2010. See description for Scenes176 above. 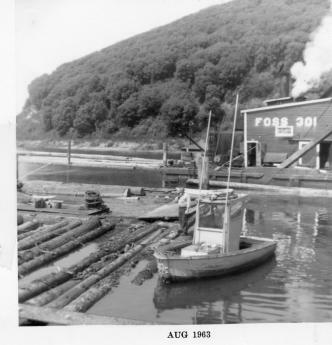 Note the floating Foss engine used in support of the newsprint facility. See description for Scenes176 above. This view is looking northeast toward present day University Place. See description for Scenes176 above. This view is looking northeast toward present day University Place. Inscription on back says "West Tacoma Newsprint [where] Grandpa Paul Miller worked." See description for Scenes176 above. This view is looking southwest toward Steilacoom. See description for Scenes176 above. 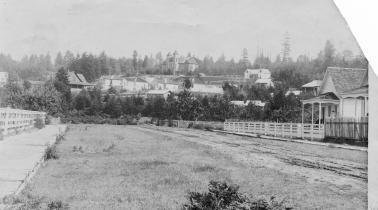 This view is looking southwest toward present day University Place. Inscription on back says "Paul and mill...not too good", the latter refering to the quality of the photo. 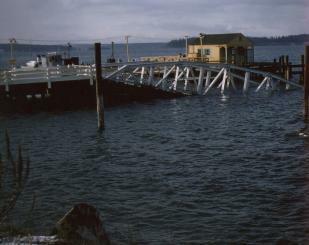 Ferry ramp at Steilacoom dock after damage by severe winds. Martin Street looking northeast. School is in far background. Same as Hoff154. 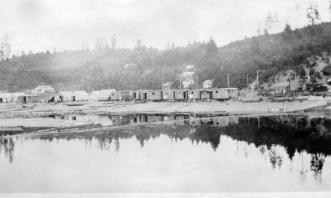 Originally thought to be Kennedy's Camp on Chambers Bay, but could also be south shore of Chambers Bay in vicinity of current (2011) Steilacoom Marina. 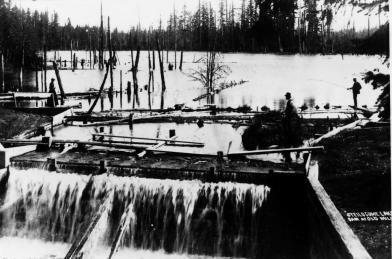 Headwaters of Chambers Creek looking south and showing the Byrd Mill sluice at left. 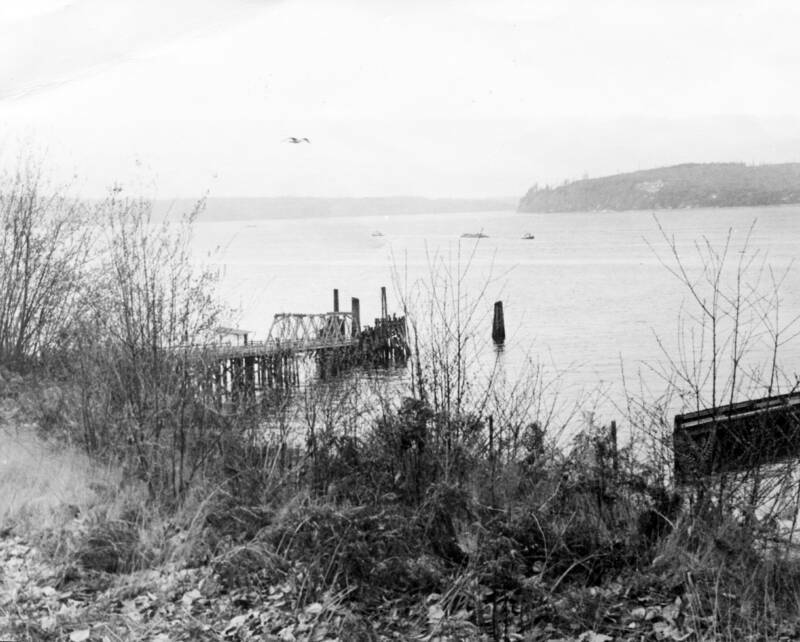 and man standing on the Byrd's MIll Road (currently Steilacoom Boulevard) bridge. Difficult to see toward the lower left corner is a man fishing in the creek. 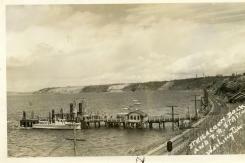 Photo from collection of Joe Johnson, Lakewood, WA. Lake Steilacoom dam with lake in background. 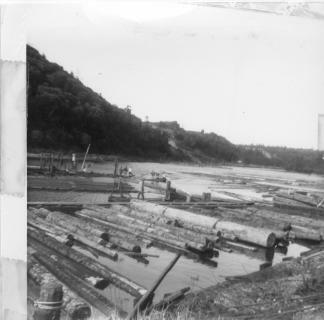 Caption at lower right sayes "Steilocome Lake dam at old mill", the "mill" being Byrd's lumber mill which is behind the photographer and downstream. Dead trees in the lake, typical during the early yeas of manmade lakes, have long since disappeared. 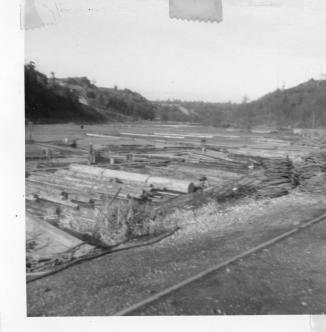 Photo from collection of Joe Johnson, Lakewood, WA. 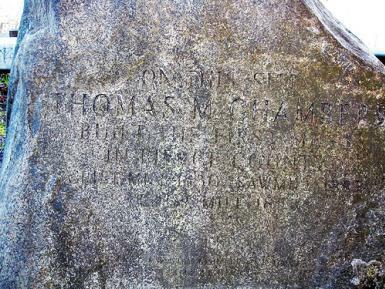 Memorial stone marking general area in which Thomas Chambers built his home, a gristmill, and a lumber mill on Chambers Bay at the mouth of the creek bearing his name. 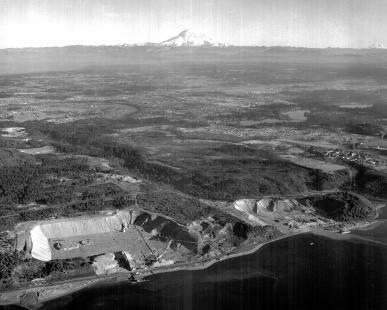 Sand and gravel mine (in University Place) with part of Steilacoom in near background and Mt. Rainier in far background. 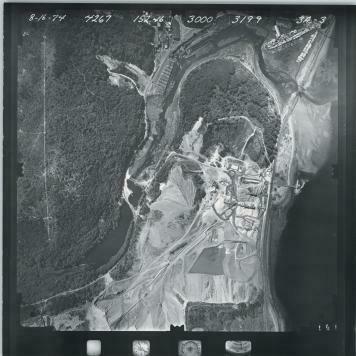 Magnification of the photo also shows the Cascade Paper Company mill on Chambers Bay with an unnatural-appearing hillside to its northeast. 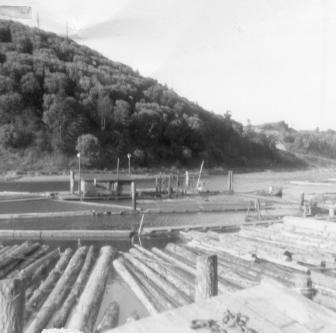 That hill was sluiced to fill in the Garrison Creek Bay providing a foundation for the paper mill. The creek was channeled underground. Photo courtesy of Pierce County Public Works. 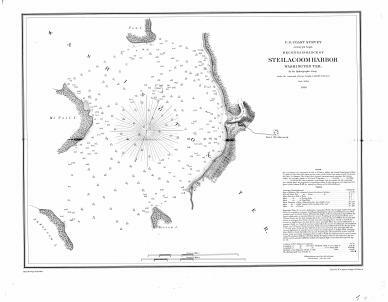 U.S. Coastal Survey chart of "Steilacoom Harbor" and surrounding area as charted in 1856. Chart courtesy of Pierce County Department of Public Works. 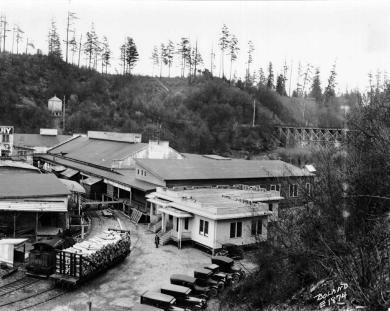 Cascade Paper Company mill on Chambers Bay. 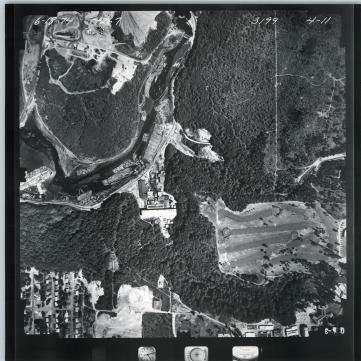 Although photo shows little detail as displayed here, the digital file is high resolution allow zooming in the reveal details. Photo courtesy of Pierce County Department of Public Works. 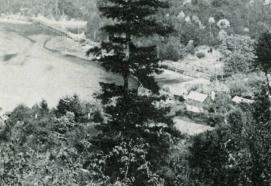 Cropped and magnified version of Scenes 201 immediately above to show Tacoma Streetcar and Power company bridge over headwater of Garrison Creek. 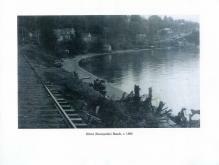 Streetcar line initially terminated at Fort Steialcoom (to the right in this photo, and eventually was continued down what is now Steilacoom Boulevard to downtown Steilacoom. Photo courtesy of Pierce County Department of Public Works. 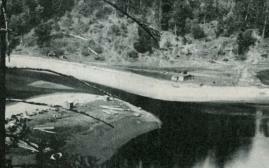 Mouth of Chambers Creek prior to construction of railroad bridge. 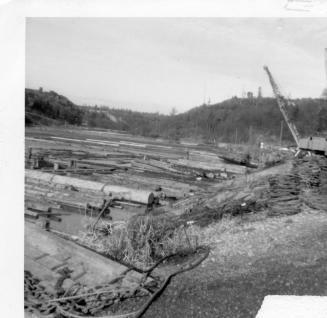 The spit starting a middle-left of the photo still exists being used for the foundation of the Steilacoom Marina. The long spit originating from the right is much shorter now (2011). 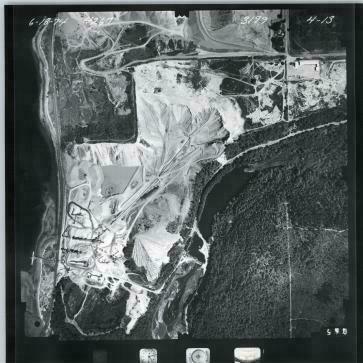 It was probably dredged when Cascade Paper built their Mill just off camera to the lower right. Photo courtesy of Pierce County Department of Public Works. Chambers Bay as seen at high tide. 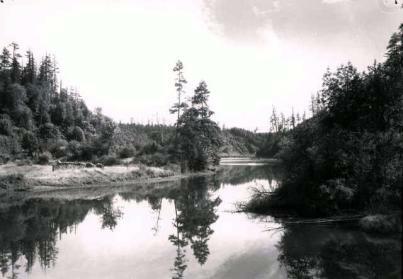 Photo was taken near the site of the current Chambers Creek Road bridge by the dam, looking generally south. The cleared area at left might have been the former site of Thomas Chambers' home. 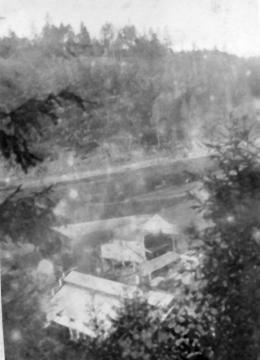 Earlier photos show a home in the same spot. Photo courtesy of Pierce County Department of Public Works. 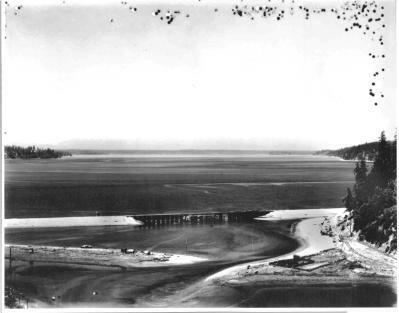 Mouth of Chambers Bay after construction of the Northern Pacific Railroad and partially completed bridge. 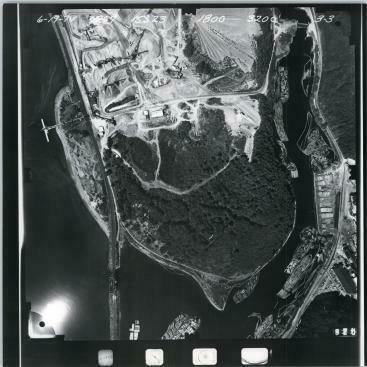 Magnification of the photo shows the remains of an enclosed area on the spit orginating from the right. Archeological digs at the site and on other places on the right shore indicate this was an important gathering place for Native Americans for the past hundreds of years. 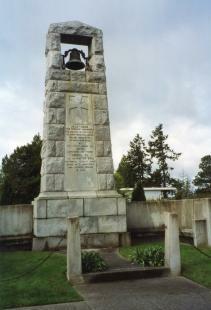 The purpose of the enclosure, erected by white settlers, is unknown. Photo courtesy of Pierce County Department of Public Works. 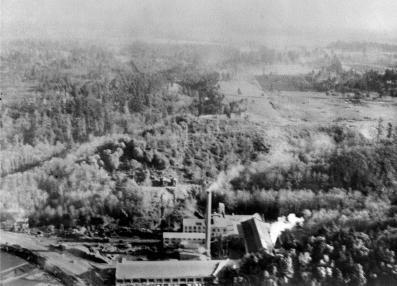 Aerial shot of the Cascade Paper Company mill. The photo is of poor quality, but close inpsection after zooming in shows Mt. Rainer in the upper right corner. The flat area taking up the upper right quadrant of the photo would become the Oakdale development in Lakewood. Just to the left of the top of the mill smoke stack are the mill water towers mill. 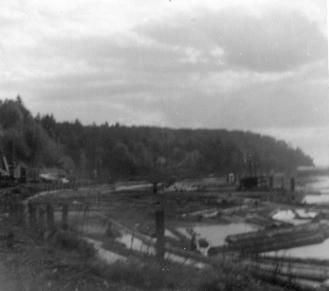 The Tacoma Streetcar and Power rail line ran past those water towers along a trace to the right than can be scene in the photo, leading to the bridge in Scenes202. 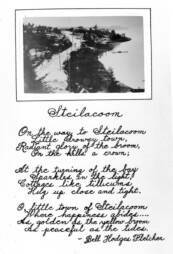 That trace is still visible today (2011) when not obscured by foilage. Photo courtesy of Pierce County Department of Public Works. 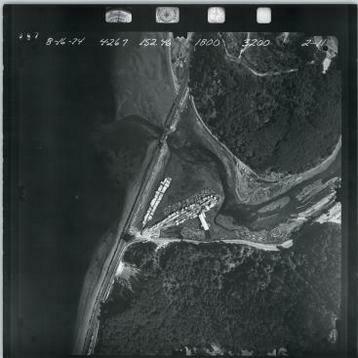 Aerial shot of the mouth of Chambers Creek and it bay. 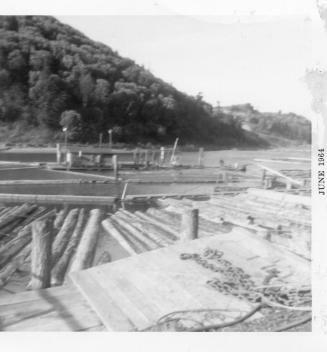 The photo is very high resolution and zooming in reveals logs floating in Chambers Bay (at right) waiting to be processed either at the Boise Cascade Paper mill or the Tacoma Narrows Lumber Company located on the spit running diagonally across the center of the photo. 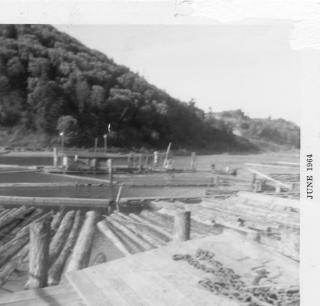 Boat houses are shown just to the left of Lumber Company. 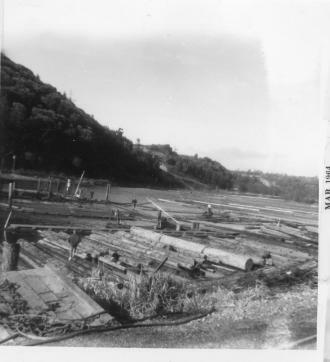 Historical records have failed to reveal the location of Thomas Chambers' lumber mill, but it is possible if not very likely that it was at the same site as the Tacoma Narrows mill shown here, given the site's access to ships anchored off shore. Photo courtesy of Pierce County Department of Public Works. 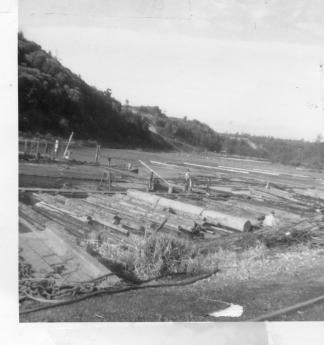 Closeup view of lumber mill in Scenes207. Aerial view of Chambers Bay, Sunnyside Beach, and "upper" Steilacoom. Photo courtesy of Pierce County Department of Public Works. Aerial view of Chambers Bay and the surrounding area. Photo courtesy of Pierce County Department of Public Works. Aerial view of Chambers Bay and the surrounding area. Shows "upper" Steilacoom, golf course, and fish hatchery. 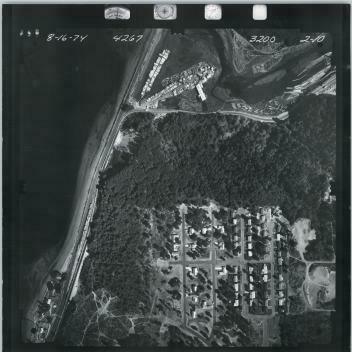 The latter is at lower left, just above and to the right of the Steilacoom housing development. A road appears to be following the ridgeline to the north from the fish hatchery, and then cutting sharply to the left just before it hits Chambers Bay. Traces of that road are still visible (1911). Photo courtesy of Pierce County Department of Public Works. The front part of the Cascade Paper Company mill facing Chambers Creek bay.